I want to spend a little more time looking at what is happening in the U.S. as it is the precursor for the coming transit of Uranus square to Pluto. Right now, they are only 1° apart from being in exact square although it will still be another year before the first aspect is made. This will happen for the first time on June 24, 2012, when Pluto will be at 8° Capricorn and square Uranus at 8° Aries. They will square each other 7 times over the following three years so this transit will be in effect for a long time. While it will affect the world as a whole, the U.S. will be affected a great deal since in 2014, this transit will link up to the Sun/Saturn square of the U.S. chart. This article cannot go into all of this, but what I want to look at is the question of how what is happening in the political environment might be a prelude to the possible issues emerging in the next few years. This article is intended to both make observations and ask questions. So, I hope some of you might want to reply with your own thoughts one the matters I will be bringing up. Filibusters were very rare as there was a general belief that in a democracy the party that won the election had the right to govern and that to block it simply because one could do so, was anti-democracy. Now, filibusters are used as a constant threat and are frequently a part of the political process. Governmental and judicial appointments by the President were normally approved since to not do so was to render the government ineffective and unable to carry out it legislated mandates. Now, there are an historic number of blocked appointments which prevent the various governmental agencies from running as they should. Sometimes it seems that the anti-government party wants to make sure that government won’t work by blocking every appointment it can. Many pundits and even some politicians openly state that they want to do as much as they can to prevent the President from succeeding even if it means that the country will suffer accordingly. This would have been conceived of as near treason in the past, since it undermines the very promise of democracy. I used to enjoy the Sunday news programs where Republicans (Nixon, Kissinger, Rockefeller, Lindsay, etc.) debated Democrats (McGovern, Symington, Jackson, etc.). There were hostilities too, at times, but no one questioned the importance of coming to a solution that would serve the American people. In fact, there was a belief that the debate itself would assure that end by making sure that whatever was decided would indeed be the best outcome of that time period. Facts were considered important. When I listened to politicians from both sides of the aisle, most of the facts were not disputed. How they were interpreted was what the debate was about. Today, if one listens to any political discussion, one will not be able to leave the program or article without feeling confused about what is and is not true. It seems that people will say anything. This is just a partial list, but given all of this, how can any consensus ever be formed? In fact, it is fair to ask the following simple question. Is the present climate one in which the actual intention is to block any effort to achieve a consensus? Is the coming to consensus even a desired goal anymore? What I see is that for many consensus is now something to be fought against with all of its might. So, how can a nation or its government stand when this is the case? So, let me ask the bigger question. Is there a ‘Will’ to remain one nation? This has been an issue for the U.S. throughout its history. Witness the Civil War. And the truth is that many in the South have not gotten over that loss. We are 50 states and though there has been the ‘Will’ to be a nation, there has always been tension between how much power the Federal and State governments should have. The growing transiting square between Uranus and Pluto will certainly test the ‘Will’ of the citizenry to remain one nation in a way that has not happened since the Civil War. And we are beginning to see it now. We hear rumors that the Governor of Texas, Rick Perry, will run for President. This is the same man who not long ago publicly wondered aloud whether the great State of Texas should secede from the union. What can this tell us about the momentum of things? And if he and other Tea Party members lose and Obama wins the general election, how will they feel about it? What will they do? Will they do what used to be done and congratulate the winner and do all they can to serve their nation to support the ‘Will’ of the people? I see no evidence of that at all. What is more likely is that it will further enrage and radicalize these forces. So, as we go into the revolutionary and passionate transit of Uranus square to Pluto, this is what we are seeing. This transit will amplify everything we now see, and it will likely become even more extreme than it is now. And the biggest question of all will be whether or not this plays out as the need for major reform and improvement (such as the creation of a national commission to review and modernize the Constitution), or will there be a movement towards overt revolution that could cause the States to break up into regions composed of ‘sympathetic’ States from the old union. It may seem to many of my readers that my take on recent events is exaggerated. I hope you are right. I would offer simply this. Watch and see if there is a ‘Will’ to make government work for the people. After all, in an ideal world, the people are the government. And if this is no longer true, then why not reform the government rather than destroy it? Why not seek solutions to the problems rather than blindly condemn each other constantly. Ask yourself, what is the natural end if there is no federal government and the States rule everything. What will that look like? For fun, I’d like to say a little about the history of the debt ceiling. To me, it ought to be something that each person with an opinion about the recent debt ceiling debacle would need to understand. How many countries in the World have a debt ceiling? Two, the U.S. and Denmark. But Denmark has set an impossibly high number so it never comes into play, which leaves only the U.S. as having a real debt ceiling. Why don’t other countries have one? Because other countries recognize that if a Legislature approves bills that result in the government bringing in less money than is going out, that it will have to borrow money to do so. If that government decides to change its approach to debt, it must take action to do so, but this would not mean that it no longer owes the money that previous Legislatures approved. 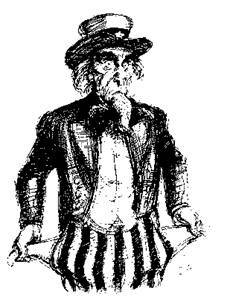 The fact is that our present Congress has behaved like a deadbeat, refusing to pay the bills on what it owes. It’s sort of like going to the store and buying a nice stereo, then using it a while, and then saying you don’t want it anymore so you announce to the people you owe the money to that you’ve decided not to pay the debt. Gee, that sure does breed confidence in the person who is owed the money, doesn’t it? When did the debt ceiling begin? It began in 1917 during WWI and was called the Second Liberty Bond Act. It was put into place so that Congress did not have to authorize every new issue of debt. But it was always assumed to be a mere formality for the same reasons as what I’ve written above. How many times has the debt ceiling been raised? Since 1960, it has been raised 78 times and done so as a formality. All of this means that the ‘crisis’ was made out of whole cloth. It was invented and to me, was an act of shooting oneself in the foot. It was not caused by debt. Yes, we have a debt problem that must be dealt with, so why would I make such a declaration? Because right now, the World is loaning money to the U.S. more cheaply than ever before. It was considered to be the ‘gold standard’ in the world’s currency. UNTIL NOW, that is. It is still considered to be in much better shape than the Euro and other European currencies. We don’t know all the effects of the debt ceiling ‘crisis’, other than the fact that S&P has downgraded the nation from its highest designation of AAA to AA+. There is some controversy about S&P itself given the fact that other countries who they still give their highest rating to are more suspect than we are. Also, there is the fact that they completely blew it in 2008 as they had no idea about the state of the economy that was about to enter the huge crisis we all know about now. But China has already issued warnings to the U.S. about its debt and has even questioned whether or not the U.S. dollar should remain the world’s currency. Few people know how many benefits come to the nation that is the recipient of this blessing. But if you are interested in learning more about this, look at history and read what happens to countries that lose this status. In every case, it meant a significant downward turn in the lives of their citizens as that nation ceases to be a world power. Today, the Federal Reserve announced that they would not consider raising interest rates until 2013. This was done to try to create a climate of certainty in this turbulent marketplace. This action is itself highly unusual as actually the Fed is handcuffing itself by doing this. What if economic conditions change and there is pressure to raise interest rates? These are times of great uncertainty made even greater by the poltical system in this country seemingly being committed to chaos and disorder. Next week the newsletter will return to its usual astrological focus. We will be looking at the Mercury retrograde cycle and the fact that there will be a very rare conjunction between the Sun, Mercury AND Venus bringing together two different cycles all at once. As always I would love to hear the thoughts about this article. One question I will leave you with as we enter this revolutionary period of the nation’s history is this. Do you think that the majority of citizens of the U.S. have the desire and ‘Will’ to remain together as a true democratic nation with all that this means? Can we find a way to come through this turbulent period with respect for the promise that this nation represents which includes tolerance for those of us with different views or fall victim to the pressures of greed, disorder, and vitriolic passions? What do you see coming for us? Hi Jim. Interesting piece. Since we are in the same age range, I too remember a Congress that got things done, and civil dialogues on television. Perhaps there was action behind closed doors that I don’t know about, but there didn’t seem to be quite the same game playing. I may disagree with you as to what end of the political wing is responsible for this. I believe that Congress has become much more conservative overall, with Republicans becoming more right-wing and extremist, while Democrats have moved toward the center, and some to the right. It’s hard these days to find a traditional Democrat who will stick to the populist ideals the Party has stood for in the past. That is the sentiment spoken by Congressman Bob Filner who is leaving Congress to run for Mayor of San Diego. He doesn’t believe Democrats have strong wills anymore. This is reflected in the debt ceiling bill vote, and the Senators Harry Reid appointed to the Gang of 12 Commission. I differ from you in that I don’t see compromise as necessarily being good. It depends on who all is involved in the compromising and the subject. I believe that the bottom line is to take right action, and I mean that in a moral sense, not a political sense. The issue of regions of the country becoming their own countries is something I wouldn’t mind, as long as California isn’t handed over to Republican types. I think California, Oregon, and Washington would make a nice country. I don’t think it would happen in my lifetime. Americans are not sufficiently engaged in politics and current events to bring that about. Rick Perry and his Lone Star ilk can become their own country for all I care. Jim, I believe there is such dissonance between the beautiful words in the founding documents of this country and what the country has become as an imperialist nation that imposes its own undemocratic will on other countries. Those words in the Constitution and Bill of Rights were written by affluent white men and really weren’t meant to include others not of their ilk. Nevertheless, the concepts were so well said that Ho Chi Minh borrowed the verbiage for North Vietnam’s constitution. I care deeply about what is going on in this nation and in the world and what it means for our collective well-being. I consider myself an internationalist, and I really think nationalism is very dangerous. This country is run by the rich, and it turns my stomach every time you refer to this country as a true democracy. Are you aware of the Citizens United decision by the Supreme Court. Anyway, it’s getting late and bed sounds really good. Nighty night. I do not think that that this country is a true democracy. It is far from that. The spirit of this country carries a democratic ideal, which is being tested more than ever right now. Sometimes the parliamentary type of government makes more sense to me than the one we have. I do advocate major changes to the constitution which would begin with the doing away with the electoral college and then end the ridiculous notion that every State, no matter the size, gets two Senators. North Dakota, South Dakota, Montana, Wyoming get 8 Senators and California and New York get two each? This is a recipe for deadlock. The reasons for this have outlived their purpose and value. Jim – an excellent analysis of what is occuring – your statement “It seems like people will say anything” sums up this country’s move away from honesty, fairness and doing what’s right to a country where leaders and others think it is perfectly okay to lie, mislead and harm so long as they get their way. Hope you will consider submitting a condensed version of this article to major newspapers for their Sunday editorial pages so you can enjoy a wider audience. You’ve provided excellent food for thought. Thank You for taking the time to encapsulate what so many of us are feeling. I agree with both of you…and its so satisfying to hear an intelligent conversation about politics between two people. Unfortunately the fact of its rarity proves my point…that most Americans are uniformed, dumbed down media junkies who haven’t got a clue. I ran into my Senator, Gallegly, at the Ventura fair and when I asked him why he wouldn’t support taxing the rich and corps. all he could could say was, “It’s the Democrats!” What an old blithering idiot!!! With people like that in Congress, who are VOTED in, I have little hope of any positive change, in fact quite the opposite. Look at London…it will happen here too. If corporations and billionaires can evade taxes and break all laws, is it any surprise when people decide to loot and burn??? I doubt if anyone is organized enough to pull off a constitutional convention or changes in statehood. Chaos reigns and its everyone for themselves in the US. One positive note: Gov. Brown is signing a bill that will make CA’s votes for Presidential elections be based on the popular vote, rather than the electorial college. But I haven’t heard much other good news, and don’t expect to until these tough squares amongst the outer planets are over with. are highly concerned about our 14 trillion dollar debt, (moving soon to 20 trillion) and to have the debate about it is totally logical. I must admit the timming was not good. However, If you go to a banker to borrow money, or raise your credit limit, does the bank not have the right to have a discussion about one’s current debt? government and what happens when you cannot get your financial house in order. Hopefully the US can learn from all this, and move forward with a common sense approach to governing. We need to elect more moderates on both sides to have a balanced approach and to eliminate this hugh gap in ideaology. Also, we need to consider our children’s future, and how unjust it would be for them to live a life of poverty because of our choices. Great article, Jim, and astute comments! I grew up in the 1960’s. The times, again, are changing, rapidly, and the climate does not look at all favorable for the middle class, nor does it bode at all well for our younger generations, as they face few job prospects and huge student loans. Michael Moore has a passionate letter that he has sent out explaining how this moment in time was slated, he feels, 30 years ago during the Reagan administration. Take a look at his site, for some Moore-style info and suggestions of what we can do, while we are watching ‘Rome’ begin to really sizzle. Jim, your article was interesting. I agree that the political fighting has become more polarized but I disagree with the reason. 1. The average white American is getting older but still represents about 70% of the population. 2. The percentage of non-white children born in the US is now the majority. This is the bases of the divide in this country. You have an older white majority that is more resistant to changes in culture and is more concerned with their own economic situation than the society as a whole. They perceive they are against a less affluent younger population that looks and communicates different than the older generation. It was this same “fear factor” or “normality bias” that has caused economic and religious wars throughout human existence. Those “in power” either fear change or blame others for not having the “normal” situation they that they were entitled to. There is an old expression, “the difference between men and boys is the price of their toys”. Until the boys in government start thinking like men and not spoiled children fearing they are not getting “their share” , things will only get worse. Good post Jim. Robert Reich makes some interesting points about this very topic in his latest blog post. Reich has it right when he says that the real issue with the US economy is jobs. He goes on to say that for a long time he couldn’t understand why Obama’s administration wouldn’t address this simple fact with a workable plan opting instead to blame the economic woes and stock market weakness on the deficit and more recently the S&P downgrade of our Treasury debt. So again we have politicians refusing to do what is in the best interest of the US for fear that the opposing party will use this opportunity to gain the upper hand. Meanwhile, we all lose. I don’t think your take on recent events is over exagerated. I think the future of the country is very cloudy and where all of this is going is hard to predict. I’m not sure if there is a will to remain one nation but I don’t think there is a greater will for the states to secede if that makes sense. I’ve never seen such animosity amongst politicians and I think truly most Americans want this to change. So, we will see what happens. Very disturbing times. In reference to your idea that senators be assigned on the basis of population I think you need to check the Constitution. The House of Representatives (the “people’s house”) was to be elected on the basis of each state’s population, that is why a census is demanded every 10 years. The Senate’s original job was to “advise & consent.” The senators acted like lobbyists for their state. The real governance was to come from the House, not the Senate. Therefore the state legislatures appointed two Senators and Congress was elected by the people. This is why the Speaker of the House is 3rd in line for the presidency. In the early part of last century an amendment was made to have sentators campaign for office instead of being selected by the state legislators and therefore they became subject to the same temptations as congress. I do not believe we will be able to stop the rampant corruption until we can take back the government from the big corporations who control it now through K Street and their millions spent on campaign finance. This is a really original idea from one of George Soros’ former partners. We are in for problems certainly but thinking outside the box is what is needed, less “theology” and more “ethics.” Keep up the good work. I would like to see a complete review of the Constitution. It needs to be modernized to the needs of the present time. Many countries in the world have done this, but in the U.S. too many people regard the Constitution as a kind of Bible. I agree with your comments about the need to end the rampant corruption ruling the entire process. First we need to fix the election process. It costs so much to run for office, only corporations and the super-rich (or their puppets) can afford it. And the process keeps getting longer.